How do I use the control panel buttons to scan a photo to a flash drive? 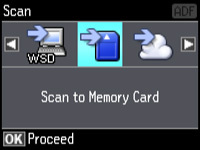 Select Scan to Memory Card. This option saves your scan file on a flash drive and lets you select the file format, quality, and other settings. Press the arrow buttons to view additional scan options, then select the one you want.